Remember that records storage, at its heart, is about risk management. The decision you make should always be based on reducing the risks of losing records vs. the cost of retaining them, whether or not you outsource the process. What might be the costs of being forced to re-create lost records? What are the costs of simply being unable to do so? Since stored records are vital to the legal and operational needs of many companies, trusting an outside company with your files is a critical decision. How can you access your records? Some providers allow you to visit, while others will deliver specified records to you. Either option is fine, so long as you can promptly access vital information as needed. If they deliver, what is the waiting period? If they allow you in, what type of arrangement is needed to check out records? Can you access and copy records on premise? Your wait time shouldn’t exceed a day, and ideally should be even less. Is the provider RIM (Records and Information Management) certified? ARMA provides a comprehensive certification program for professional records administrators. If it’s important to adhere to these standards for your organization, can your archive provider meet the requirements? While this isn’t a showstopper for many companies, adherence to the ARMA standards can help you understand the process your provider uses to store and manage records, not only yours, but its other clients. Inquire about HIPAA compliance. 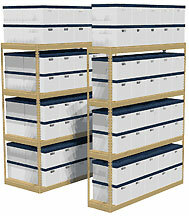 If the records are medical in nature, is the storage center HIPPA compliant? Some centers aren’t equipped to handle this requirement. Ask about the fee structure. In a cost-driven world, this is a natural question. You’ll receive a total price, and probably a price per box with most bids. Are the fees all inclusive? If there are additional charges for various services, and what are those charges? It’s worth checking various scenarios for hidden or unstated fees. How are your records protected against physical threats? In the event of a power outage, storm, earthquake or fire, how are your records protected? If the records storage company you are working with doesn’t have documented processes, that’s a red flag. Simple questions about mundane problems like protecting stored records in the event of a leaky ceiling should also be asked. How are the racks protected from being knocked over? How are the records protected from ambient moisture, dampness, excessive heat, light, airborne dust/debris, or other environmental dangers? In the event of a fire, are the records storage boxes protected as well as possible from water damage? The records storage area should be on a ground floor with dock door access if large volumes of records are being stored. What records management organizational system is used? Some providers have proprietary systems or software that allow you to log in and access data on your stored archives. Some have manual systems. Both are acceptable for the right situation. What security measures are used? How is the warehouse guarded? What types of alarm systems, surveillance, and security camera systems are employed? Are there lockable areas for highly-sensitive records? Who has access to your stored files? Are all employees with access screened with background checks? Ask what happens if the company detects that some of your records are missing, or if someone has stolen or otherwise accessed them without authorization. The policies should be documented in advance. Is the provider able to provide a PCI compliant solution? If your operation is PCI-compliant, does your records archive company adhere to the standards necessary to maintain it? Most people focus on the digital side of this issue, but paper records are also considered part of a comprehensive compliance program. Excellent providers can help you connect your electronic and physical records programs. Storage cartons: Does the provider charge for them? Does the provider allow you to provide your own? Ideally, you want a secure, reasonably priced records storage center that protects your critical information assets from various environmental and emergency issues to its utmost. You will want frequent and liberal access, ideally managed through a web interface for your convenience. 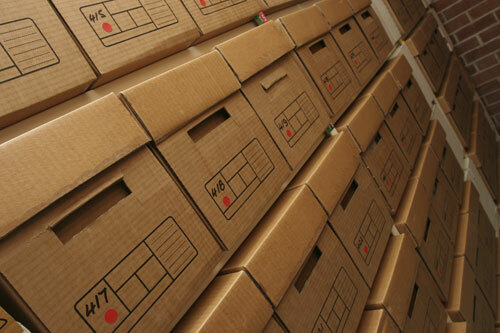 You should weigh the costs and process changes against the option of storing records onsite. More resources include our article, “Calculating Records Storage Needs”, and our specification area for various records storage and rack systems.